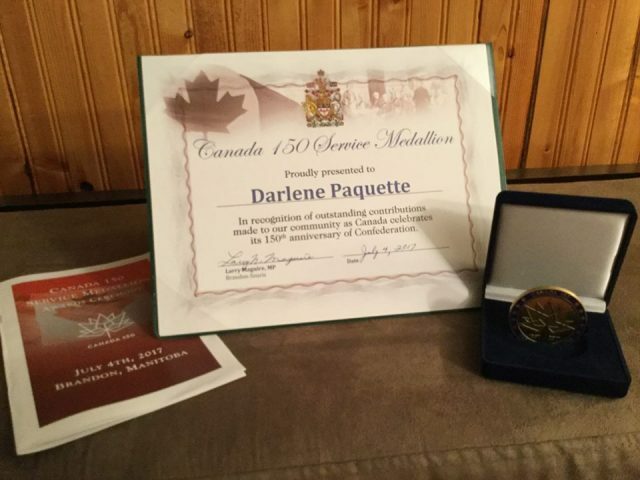 Darlene Paquette received a Canada 150 medallion. Decades of volunteer service by a Brandon University (BU) staff member were recently recognized. Darlene Paquette, a Learning Technology Assistant in the Faculty of Health Studies was one of 30 recipients of a Canada 150 Service Medallion, awarded by Brandon-Souris Member of Parliament Larry Maguire. The medallions were presented to volunteers in recognition of their leadership, service and role in improving the quality of life for others. 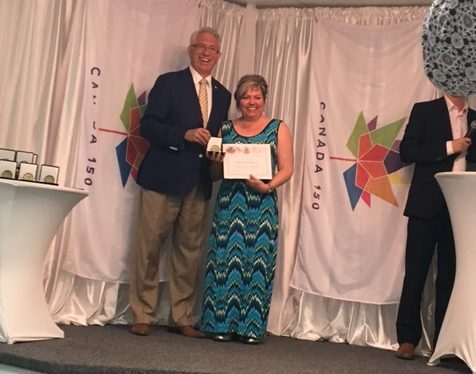 Darlene Paquette received a Canada 150 medallion from Brandon–Souris MP Larry Maguire..
“It was a really special honour to be recognized, especially for Canada’s 150th birthday,” said Paquette, who has been an active volunteer for more than 35 years. Paquette has been a volunteer with the Canadian Cancer Society, canvassing door-to-door, selling daffodils and organizing two fashion shows. She has taken part in the Cancer Society’s Relay for Life, and as a cancer survivor was the event’s Honorary Chair in 2009. Paquette was also a member of the CancerCare Manitoba Aboriginal Community Partnership Community. She is currently a director on the Keystone Centre board. She has also served on the Brandon Friendship Centre Board, the Art Gallery of Southwestern Manitoba board, the Local Area Management Board for the Manitoba Métis Federation and the Westman Justice Committee, various Brandon Regional Health Authority committees and the Friendship Everyday Provincial Board, overseeing programs for individuals who are intellectually challenged. In addition to volunteering at the 1997 Canada Summer Games, Paquette was also a member of Red Willow Tipi, an organization that assisted with the Tipi Village at the ’97 Games. In 2010 Paquette was the recipient of a YWCA Women of Distinction Award, and in 2011 she received the Brandon University Board of Governors’ Community Service Award.